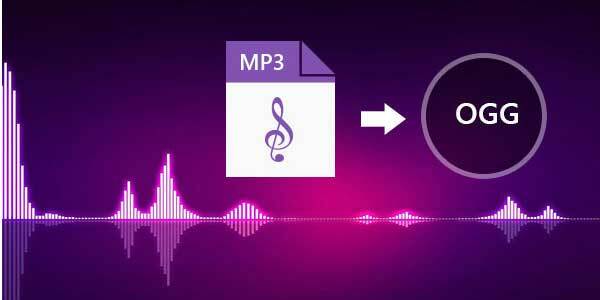 Both MP3 and OGG are well-known lossy compression audio formats that are great for downloading, copying, and storing. Even though MP3 is much more popular and widely-used than OGG, an audio file in OGG format has its own advantages. Specifically, compared to MP3, OGG is able to save audio file in smaller size and its bit rate compression varies with different need. Better yet, OGG is completely free to all as an open source, which, as a result, is not constrained by any patents. This is also the reason why most of users would like to convert MP3 into OGG. If you want as well, just take a look here. 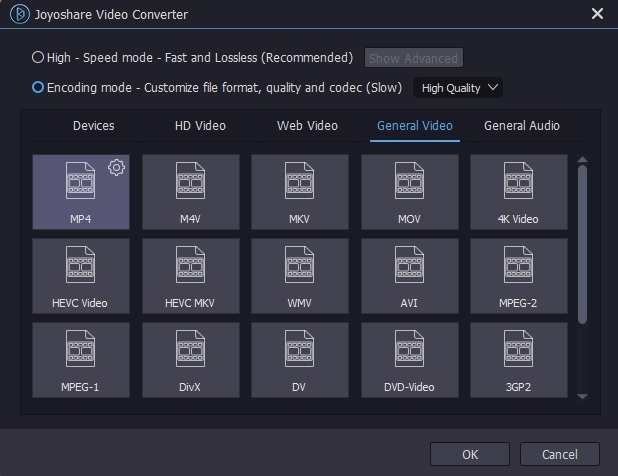 Joyoshare Video Converter can not only work as a dedicated video converter but also perform as a simple audio converter. This 2-in-one solution facilitates you a lot to convert various videos/audios in an easy manner. With its assistance, you have utmost right to convert imported files to general audios, including MP3, M4A, AAC, AC3, WAV, OGG, MKA, M4B, WMA, ALAC, AIFF, FLAC, APE, etc. or transfer whatever you want to desired devices, like iPhone, iPad, PSP, BlackBerry Bold, Windows phone, Apple Generic, Apple TV, etc. Additionally, it's workable to adjust parameters in your own way, such as codec, channel, sample rate and bit rate. If you want, you can also trim audio flexibly. Simply get Joyoshare MP3 to OGG Converter started on your computer. Drag and drop ready MP3 files to the main interface or click on "Add Files" on the top to import MP3 audios. It depends on you whether to add one file at a time or import multiple files to convert. Continue to press the "Format" panel in the bottom left corner. Go to "General Audio" to select "OGG" format. Meanwhile, you can tap on the Gear icon at the top right corner to specify configuration, like codec, bit rate, etc. There is a Edit icon behind the MP3 audio file. Press on it to trim needless audio section off. 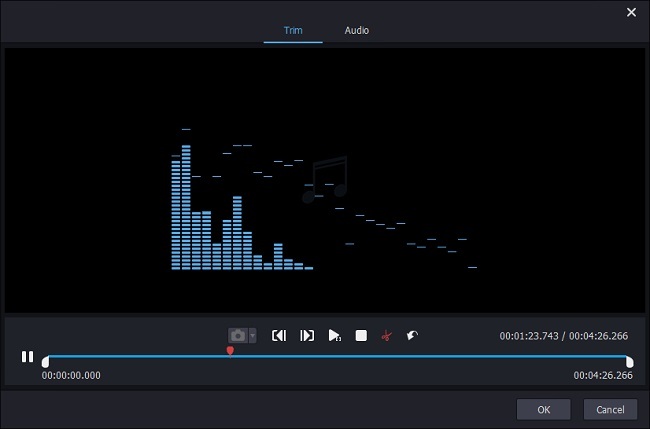 What you have to do is just to move the sliders to set desired portion and click the Scissor icon to cut it. Then hit "OK" to confirm operation. 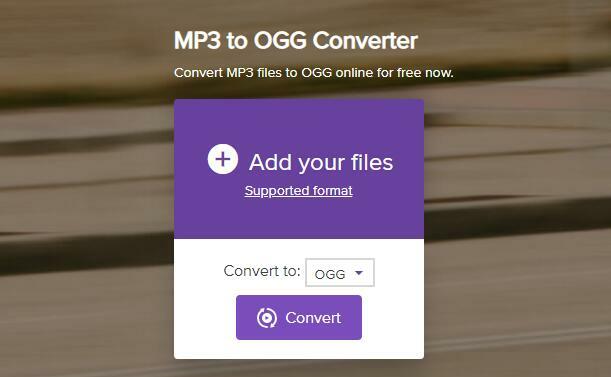 Now you can tap on the "Convert" button to initiate MP3 to OGG conversion. Wait a moment. Afterward, please go for "Converted" folder to check the finished audios. Happily, there are diverse online free audio converters in current market that allows you to convert MP3. Among them, Wondershare Media.io MP3 to OGG Converter is a good option, especially for newbies. It supports popular formats well. However, the audio file can be limited to 100MB and you likely have to wait for a long time due to the slow conversion speed. In one conversion, a maximum of 2 files can be allowed. Step 4: Click "Download All" to save converted audio on computer or to Dropbox.